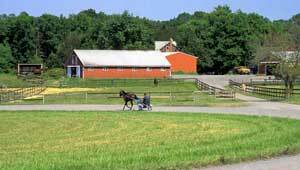 For generations, residents of Voorhees Township have cherished the sight of the trotters training on this farm, which was owned by the Stafford family for more than 225 years. Developers made repeated efforts to purchase the 140-acre farm only 20 miles from Philadelphia. But the local community wanted to preserve agriculture and use some of the land as a public park. To protect the land, TPL helped assemble funding from more than half a dozen public and private sources, and protected the property in 2004. Plans called for a working farm to remain on part of the property while the rest would be available to the public for hiking, birding, and education.